Learning to scuba dive should be an amazing experience. For some, the sense of freedom and discovery associated with diving is life-changing; but for others, the transition to life underwater is not so easy. Beginner divers often experience difficulties during training or in the months immediately afterward. If these issues are not overcome, they can escalate to the point where new divers give up the sport rather than facing the same challenges over and over again. In this article, we look at a few of the most common problems faced by new divers and how to address them. Equalizing is one of the first skills a new diver learns, and for most people it eventually becomes instinctive. However, difficulties are common, and many people who stop diving cite an inability to equalize as the reason why. First, it’s important to understand what equalizing is. 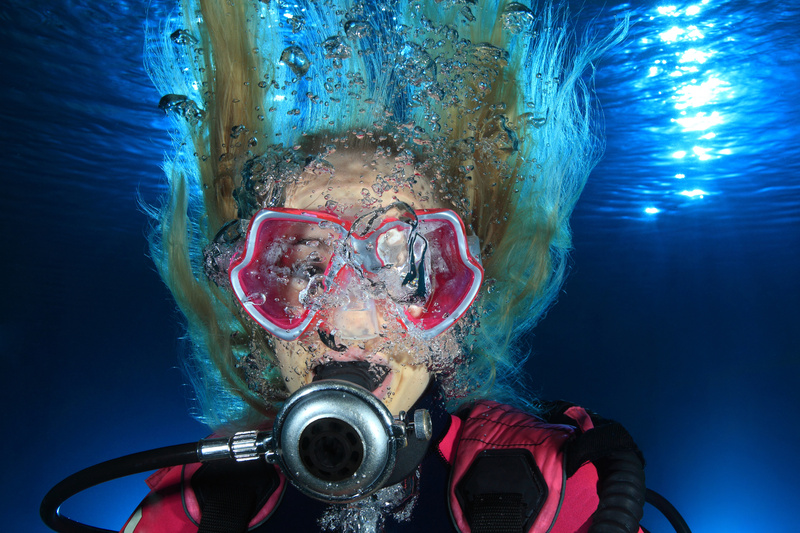 It’s the process of introducing air from the back of the throat to the middle ear via the Eustachian tube so that the pressure inside the middle ear is balanced with the increase in surrounding pressure that occurs as a diver descends. The Eustachian tube is protected via a one-way valve called the Eustachian cushion, which must be opened in order to allow air to pass through. During training, divers are taught to do this using the Valsalva Maneuver. This involves pinching one’s nose and blowing gently, thereby forcing pressurized air from the back of the throat to open the Eustachian cushion and pass into the middle ear. This method is only effective if you equalize every few feet before pain occurs. If your ears are in pain, your Eustachian cushions are already locked closed by the increase in surrounding pressure, and the pressurized air forced from the back of your throat by the Valsalva Maneuver is not strong enough to open them. In this case, you need to employ methods that use the throat muscles instead of air pressure to open the Eustachian cushion. These include swallowing and moving your jaw from side to side. If you still can’t equalize, ascend a few feet and try again. If equalizing is a persistent problem, descending on a line can help to control your descent, giving you the time to equalize almost consistently on your way to the bottom. 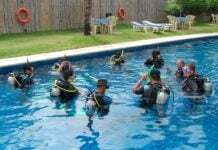 For many divers, the entry-level course’s most challenging skill is mask clearing. The sensation of water flooding into the mask often triggers panic, especially if it enters the nose. Our brain tells us that the risk of drowning is imminent, and our first (but potentially life-threatening) instinct is to strike blindly for the surface. Like most things, the key to mastering mask clearing is practice – but too often, instructors rush through this skill leaving new divers uncertain of their ability to cope with a flooded mask situation in real life. If left unaddressed, this uncertainty can be the cause of a fear that eventually puts new divers off the sport for life. The best way to get over your mask clearing issues is to ask your instructor to spend extra time working on the skill with you in a one-on-one session. The first step is to get used to the unnatural sensation of breathing underwater without your mask on. In water shallow enough to stand up in, practice inhaling through your regulator, and exhaling through your nose until the feeling of water on your face becomes normal. Next, practice letting a tiny amount of water into your mask and clearing it. Master the process of expelling the water before gradually increasing the volume bit-by-bit until you’re confident that you can clear a fully flooded mask. Controlling your buoyancy is the difference between effortless movement underwater, and the feeling of being frighteningly out of control. It affects your air consumption, your position in the water column and ultimately, your safety – and yet, many divers graduate from their entry level course with limited mastery of the skill. The first step is to do a buoyancy check every time you dive. Take a normal breath, then deflate your BCD at the surface with your mask and regulator in place and see how far you sink. If you’re correctly weighted, you should float at or around eye level. Adjust your weights accordingly, then make sure to record the amount of weight that you use in your log book. This provides a reference point for the future, so that in time you’ll be able to accurately judge how much weight you need for different situations – e.g. salt or freshwater, steel or aluminum cylinders and different wetsuit thicknesses. If you’re correctly weighted, you should be able to control your buoyancy underwater by inhaling or exhaling, instead of relying on your power inflator. This saves air and gives you greater control over your movements. Trim is equally important: make sure that your weights are evenly distributed on your body. If you find that your problems with buoyancy persist, enrolling in a Peak Performance Buoyancy course is an excellent investment. Sometimes, a diver’s experience is marred not by an inability to master basic skills, but by a series of psychological factors. Already existing phobias can be exaggerated underwater, with claustrophobia (the fear of small spaces) and agoraphobia (the fear of open spaces) being two of the most common. The former is especially problematic in poor visibility, while the latter may be triggered when the water is uncommonly clear. Sometimes, fear is caused by a diver’s tendency to focus on all the things that can go wrong underwater. Any kind of phobia can swiftly lead to anxiety, resulting in hyperventilation, over-exertion, and debilitating panic. There are several ways to control fear underwater, and you’ll need to experiment to find out which works best for you. The easiest way to avoid a panic attack is to stay within your comfort zone – if your anxiety is triggered by a strong current or overhead environments or unusually deep dives, don’t sign up for dives that involve those factors. Alternatively, try identifying the source of your fear and taking the time to address it. For example, if you find yourself fixating on the horror of an out-of-air situation, revise the steps for a CESA or an alternate air source ascent until you feel confident that you can deal with the problem if it happens. Meditation and breathing exercises can also help.